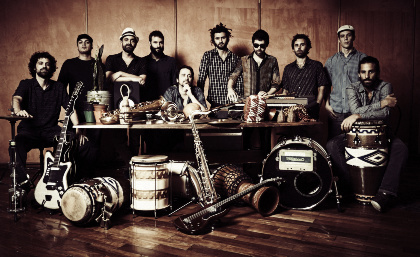 With their sure-handed, genre-spanning fusion of Afrofunk, Guinean malinké, Arabian dub, Brazilian candomblé, samba, cumbia, carimbó, adapted Afro-Brazilian chants, Cuban blaxploitation, Angolan guitar music and whatever else they feel like throwing in, Bixiga 70 have propelled themselves to the forefront of Brazil’s contemporary instrumental music scene. Named after the cultural melting-pot of their home base in São Paulo’s Bixiga neighbourhood plus a tip of their hats to the inspiration of Fela Kuti’s Afrika 70 band, the ten musicians from diverse backgrounds operate as a collective, sharing composer credits and running their own recording studio. 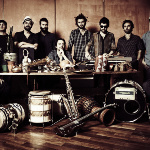 Their 2014 album Ocupai gained them international attention and invitations to Europe, the US and Morocco. They landed their latest album III on the redoubtable Glitterbeat label, a further luminous mix that posits an irresistible argument for having a good time.